The Great Lakes - St. Lawrence waterway bisects eastern North America and has become a focus of intense population growth and industrial development. As a result, it forms a formidable barrier to the north-south movement of wildlife. 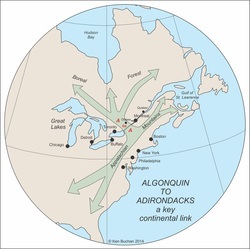 The A2A region is the most important link across the waterway, because of its unusually high biodiversity and because it is anchored by the large Algonquin and Adirondack parks which are connected by the lightly developed Frontenac Arch. Hence, A2A is critical in maintaining connectivity in the eastern portion of the continent. For more on the connectivity of this region, see the Sustaining What We Value mapping project. 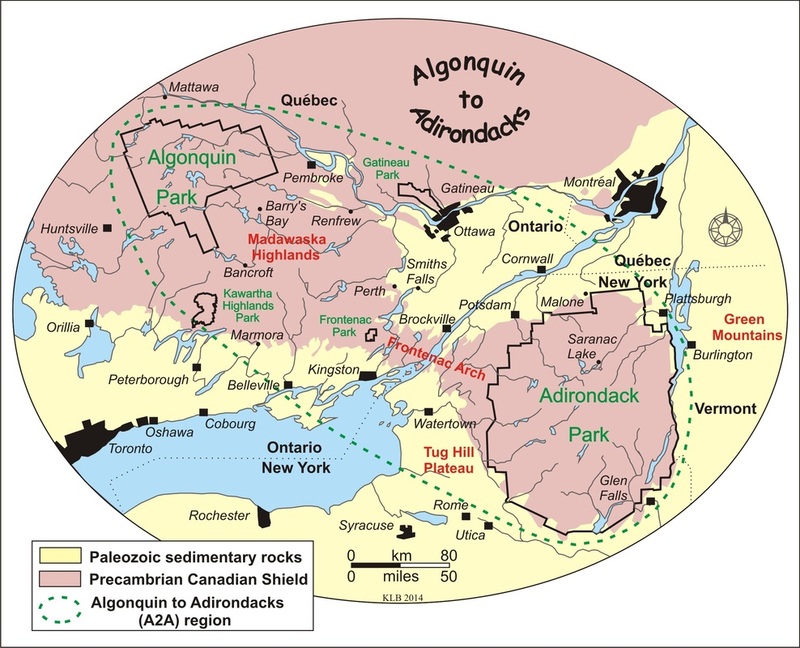 The region extends from the southern boundary of Adirondack Park, in New York State, to the northern boundary of Algonquin Provincial Park, in Ontario, and encompasses the area between the two parks and a buffer zone. On the Canadian side, A2A includes the national capital city of Ottawa and the Ottawa-Gatineau Census Metropolitan Area, pop. 1,451,415, along with smaller cities, towns and hamlets. On the U.S. side, A2A includes St. Lawrence County, pop. 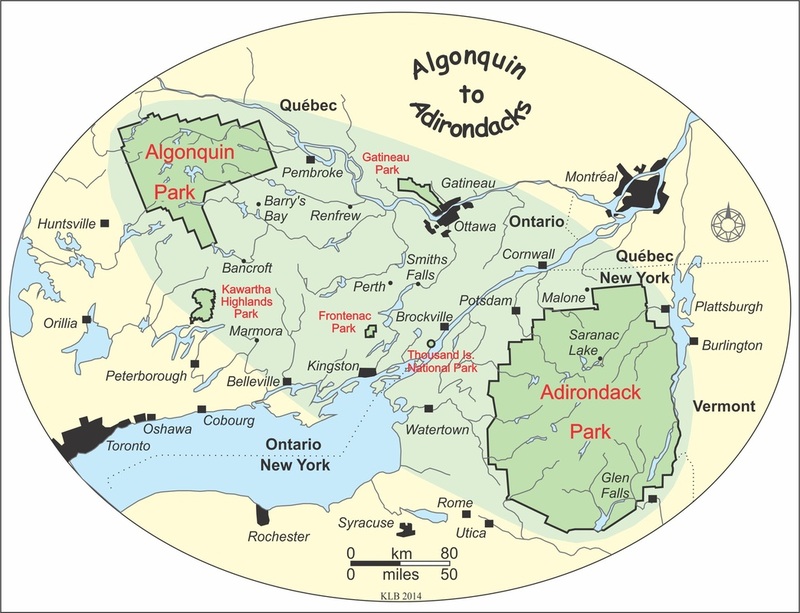 111,944; Adirondack Park, pop. 130,000 (in 103 towns and villages); and many other small towns and villages. 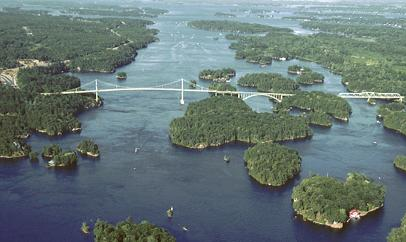 The St. Lawrence River bisects A2A, running the length of the Canada-U.S. border and flowing 1,197 km (744 miles) from Lake Ontario into the Gulf of St. Lawrence. The Ottawa River runs 1,271 km (790 miles) along the Quebec-Ontario border to the St. Lawrence River. 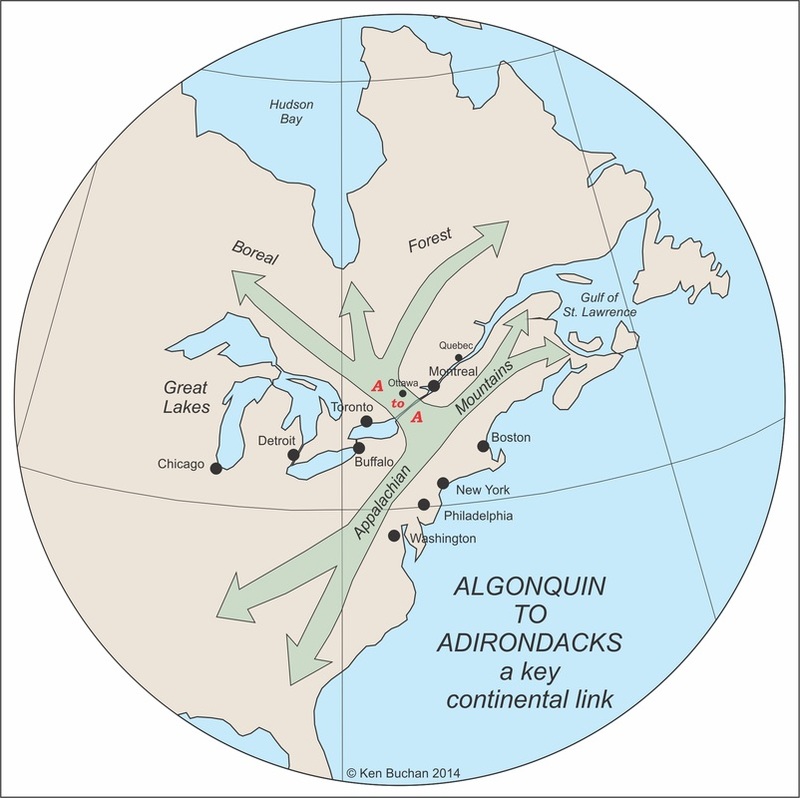 Other major rivers crossing the A2A region include the Bonnechere (175 km, 109 miles), Madawaska (225 km, 140 miles), Mississippi (100 km, 62 miles) and Moira (165 km, 103 miles), in Ontario, and the Indian River (75 km, 47 miles) in New York. Water flow in the majority of these large rivers has been restricted by dams installed for hydroelectric power generation.